Not that we exactly needed the Baltimore Police Department to delete footage from a protester’s camera to know this, but it helps make the point: the Baltimore Police Department is completely out of control. Of course, this has been evident for some time, but never more so than in the case of the murder of Freddie Gray, who was targeted and chased for no good reason, forcefully taken into custody, made to disappear for 30 minutes while being transported three blocks from the scene of his bogus arrest to the local precinct, and finally turned up with a still-unexplained broken neck. The officers responsible are currently on paid leave. Seems fair. As any reasonable person in any reasonable society would expect and support, vocal protesters—in growing numbers—have made a daily three-block pilgrimage from the scene of Mr. Gray’s arrest to the Western District precinct, home of the officers responsible for his death, there to peacefully advocate for a kind of justice that is all but anathema to the local government when it comes to cases of police brutality. 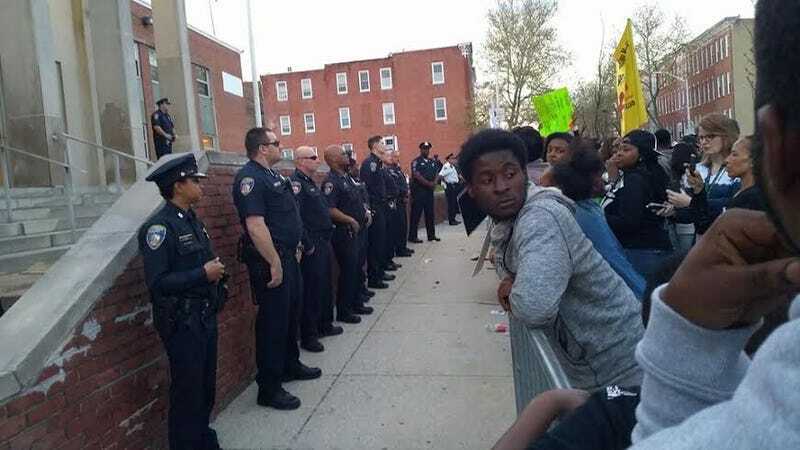 Tuesday afternoon’s protest wound up at the doorstep of the obscenely guarded precinct, where an activist organizer (who asked to remain anonymous) from Baltimore BLOC and A. F. James MacArthur, a photojournalist from the Spectator, mounted the steps to take photos and video of the assembled crowd. This dangerous intrusion on, umm, public property was enough to trigger a swarm of police officers, and the two individuals were detained and taken into the building. The confrontation was filmed by BLOC protester. Yeah, just what the hell was going on in there, anyway? That’s some primary reason for contact you’ve got there. “Protest.” Cool, cool. We were on the steps for several minutes before being arrested. Several days earlier we had been on the same steps for the DURATION of the event, moving about unmolested. The attached shot [see below] shows me BEHIND a police commander who was well aware of my presence Saturday, and had no problem with me being there, as I was only taking pictures. We were in the police station for at least an hour I believe. We were searched, then initially placed into cells. Within a short moment a police commander told officers to remove of from cells and allow us to sit on a bench. Then the command was given to take the handcuffs off us. I have to make clear, there was mass confusion inside. Right after we were arrested and placed in handcuffs, no one really seemed clear on just what to do with us. We repeatedly asked what we were being charged with, and no one could tell us. There was no clear plan or organization. It was obvious they quickly realized they may have gone overboard and made a mistake. Eventually the words “detained” started being used rather than “arrest” and we were told we’d be released at some point. Officially the citations are part of an “investigative stop.” Therefore we were never formally booked, there is no court date. However our ID’s were taken, run for warrants, and obviously logged and added to databases as “known agitators” or some sort of other classification. Baltimore Mayor Stephanie Rawlings-Blake has been making quite a name for herself, appearing regularly on MSNBC and other news programs as a voice for responsible local government reaction to cases of police brutality, which is fairly astonishing, given that her police department is running wild on her city’s streets with a degree of violent recklessness that would make Avon Barksdale curl up under his covers and weep. Baltimore has been achingly slow to move towards simply equipping officers with body cameras, a foot-dragging exercise supposedly done to protect the city from wasting municipal funds, which, if we are to buy this lame and ridiculous excuse, are apparently much more important than justice or the lives of civilians. In fact, last year the mayor vetoed a bill requiring that all BPD officers be equipped with body cameras, electing instead to study the issue via a mayoral task force. In the time since, she’s told anyone who’ll listen how committed she is to the idea, but no one is holding their breath, least of all the man whose voice-box was crushed by her police department, because he died from his injuries. The investigation is ongoing. Too bad the arresting officers weren’t wearing body cameras! Or, perhaps there’s another reason neither Baltimore Police nor the city’s rising, ambitious, media darling of a mayor are particularly interested in having the the department’s numerous unlawful violent confrontations on video? As Tuesday’s episode demonstrates, the crooks in suits and uniforms and badges, for all their public posturing, are still profoundly camera-shy.